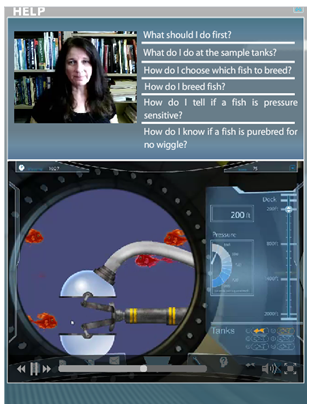 Rigglefish is an educational game designed to immerse middle school students in genetics and the process of scientific inquiry. 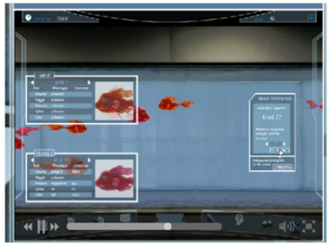 Developed by VelScience, Rigglefish represents a collaborative effort between the University of Louisiana at Lafayette and Texas A&M and it was a gold medal winner at the 2011 Serious Play Conference. You do have to request a guest login to access the game and you should plan to spend at least an hour investigating the game world. Rigglefish grabs your attention from first with a bit of sensory allure in the form of a video that introduces a mystery. You’re Dr. Waters, sent to an underwater lab to breed a superior race of fish that can produce the lipid, Omega-X, a protectant against a deadly bioweapon. That’s the emotional hook that adds to your perceptual arousal, but that’s not all you’ll need to do. There are other desired genetic traits you need to select for— like pressure insensitivity, spikelessness, and less wriggle—in order obtain a fish that’s easier to handle in the lab. 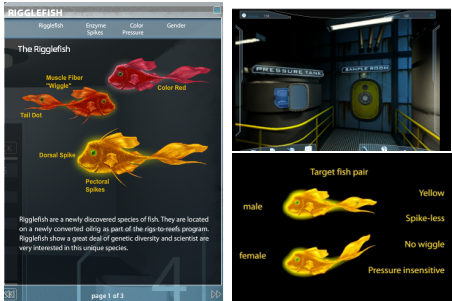 While playing Rigglefish, you’re focused on relevant real-world genetics tasks (characterizing, selecting, and breeding fish to obtain desired traits in their offspring) while your curiosity is stimulated to solve an imaginary problem. You have quite a bit of control over different aspects of the game, which enhances your sense that the game is personally meaningful. For example, you can choose which fish to catch and at what depth to catch them (which has an impact of fishes’ traits—there are more yellow fish at lower depths). The satisfying “glug glug” sound the bathysphere makes as it descends is also pretty cool!Back at the lab, you can choose to characterize fish in sample tanks or make the riskier choice of going straight to the breeding tank. Although the game has some “rails,” you can make varied decisions along the way and get feedback as you breed fish with more or less desirable traits. The game also matches the motives of players by allowing you to choose whether you receive points or not. I did choose scoring to see what it was like when I explored the game. Although genetics can be a daunting subject, there’s lots of ways to build confidence in the game. 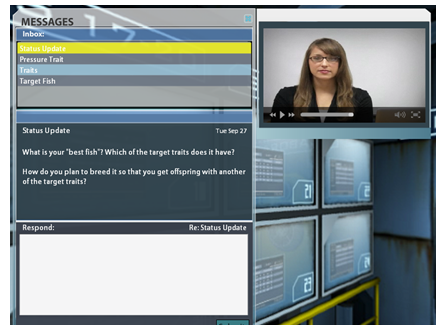 The introductory video (which can be skipped) sets the stage for what you need to do to succeed in the game. Additionally, you can access a help icon at any point and pull the information you need (versus being forced to proceed linearly through a tutorial). You also get feedback as you breed fish. Choose the right genotypes and you’ll get more yellow, less spiny fish, for example. Although the visual feedback you can obtain from “your” offspring is an extrinsic motivator, it’s intimately connected to the intrinsic satisfaction of mastering a genetics puzzle, so it’s actually a lot more satisfying than the points feedback, in my opinion. From time to time you’ll get an audio message from someone on the surface who will comment on your progress and pose challenge questions, providing verbal reinforcement and further opportunities to consider your actions.These are unexpected and variable in timing, which tends to make them interesting and more satisfying. While your fish sampling can be a matter of luck (not all genetic traits are readily connected to visual cues or phenotypes), your breeding outcomes can be stacked in your favor by your own skill in picking the right types of fish to breed, enhancing your feeling of satisfaction. This is one of those rare educational games that’s engaging, fun, and manages to achieve some learning objectives along the way. I think this is because the learning objectives are integrated with the mechanics of the game (versus being tacked on as an afterthought). The only downside is that you only have access to the game for 24 hours at a time so give yourself a bit of continuous time to enjoy it. It’s worth it!